Pogostemon is a large genus from the family Lamiaceae, first described as a genus in 1815. It is native to warmer parts of Asia, Africa, and Australia. 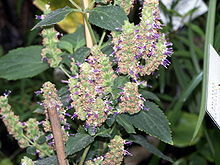 The best known member of this genus is patchouli, Pogostemon cablin, widely cultivated in Asia for its scented foliage, used for perfume, incense, insect repellent, herbal tea, etc.